When my son was small he didn’t show any interest in food. All his thoughts and energies were devoted to games. Therefore I always tried to invent new solutions to stimulate a little curiosity in food. I believe that only curiosity gives some children reasons to approach food especially when the stimulus of hunger is not present. I used a lot of the stories and presented the dishes as if a little bird told the tale. When my cousin Stefania asked me to work on some stories to match the recipes I found it easy to draw from the archive of the stories my memory holds from that period of time. This dish contains everything needed for a complete meal. Boil the water with the broth granules, when it boils add the rice and continue cooking for the time described on the package. Place the cube of spinach in a pan with a little boiling water and cook until fully thawed. Drain and squeeze the spinach. When the rice is cooked, drain the water and season with butter and parmesan. Divide the rice into two parts. In one add the spinach and mix well. 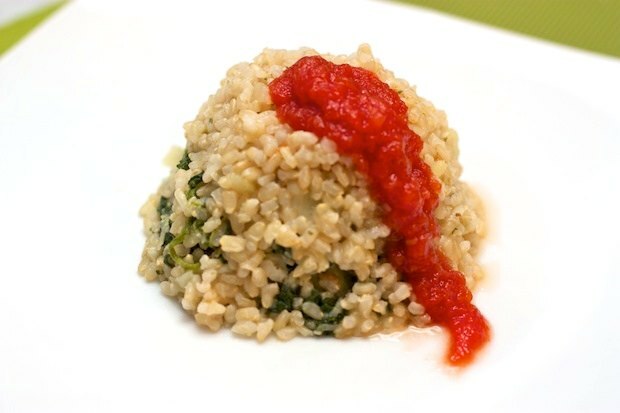 Arrange the rice on a plate and at the base by place the rice with spinach on the bottom and the white one above. This should form the shape of a small volcano from which descends the tomato sauce.